What Is Your Child Learning in Math? The Ontario government recently released a parent fact sheet and a teacher’s guide on Focusing on the Fundamentals of Math in grades 1 to 8. In the guide, teachers are asked to focus attention on expectations from the Number Sense and Patterning strands of the current math curriculum and are also asked to focus on student understanding and sense-making before formal methods, such as algorithms, are introduced. York Region teachers have always worked to develop strong number sense and computational fluency while supporting student understanding of underlying concepts. All educators in our board continue to support students in becoming confident problem solvers who use mathematical knowledge, skills and processes to be contributing members of a changing society. Septemb​er is a great time to start building routines at home which can support children in developing a positive disposition towards math. Providing opportunities at home that promote math talk can support a child’s mathematical knowledge and understanding. Whether you are, shopping, cooking, playing a game, organizing, taking a walk, or reading, there are many opportunities to highlight math in different ways. Ask your child to estimate how many of a grocery item (for example, a type of fruit or vegetable, bread or pet food) your family will need for the week. At the end of the week, have your child count the number actually used. Give your child an imaginary budget to spend at his or her favourite store (flyers or online catalogues may be helpful). Without writing down the amounts, have your child choose items to purchase. He or she will have to use estimation to stay within the budget. Then, have your child add up the actual costs. Did she or he stay within the budget? For a challenge, help your child estimate any taxes. Build strong, positive attitudes about math. When children feel positively engaged and successful, they are more likely to stick with an activity or a problem to find a solution. 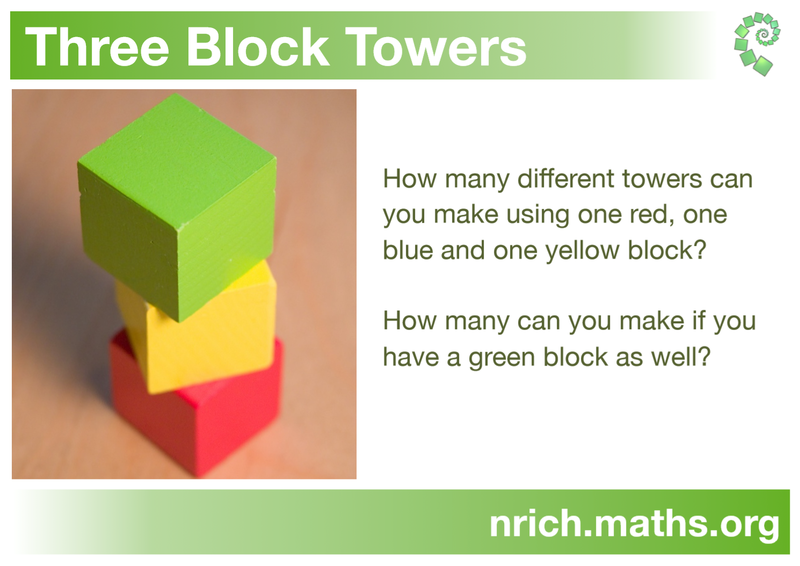 Begin with activities that meet your child’s level of mathematical understanding. Early success in solving problems will build your child’s confidence. Gradually move to activities that provide more challenge for your child. Which One Doesn’t Belong is a great activity that promotes mathematical thinking because there are many “right” answers - it all depends on their reasoning. Another great way to get your child talking about math is using images and questions from Estimation 180. This website has a series of images and encourages children to think about answers that are too high, too low and just right (Goldilock estimates). How many total cheese balls in the six containers? At school, students have opportunities to engage in problem solving tasks. At home, mathematical problem solving can take on many different forms. For example, budgeting, time scheduling, measuring and constructing are all situations where children would need to problem solve. Problem solving, being the process of finding solutions to challenging issues, is an essential component of your child’s mathematical journey. Check your answer - does it make sense? How would you state this problem in your own words? How does this problem remind you of a problem you have solved before? What problem solving strategies have you tried? What strategy will you try next? Were there parts of the problem that were easy or challenging? Does your answer make sense? Why? What is the greatest number of Friday the thirteenths that can fall in one year? These ideas will help your child see the importance of math in their everyday lives through fun and interactive ways. Using effective questions when talking about math, supports the development of your child’s mathematical reasoning. The use of questioning provides children with opportunities to share and clarify their ideas, draw conclusions, and explain and explore new strategies. With good intention, we often rush to provide our children all the information they need to solve a math problem. By giving your child this information too quickly, they may not think deeply about the problem or engage in mathematical processes. What strategy did you use? How did you estimate what the answer could be? Tell me what is the same? What is different? How did you know where …? How did you know which …? How did you know when …? How do you know your/our answer is reasonable? Would this work every time? Can you/we think of any examples that don’t work? Have you/we found all the possibilities? How do you/we know? What have you/we discovered about __________ while solving this problem? Show your child an image and ask them “What do you notice? What are you wondering about?”. This promotes mathematical thinking - and then you can have them investigate one of their wonderings and come up with a solution. What a great time to ask them the questions above to really uncover what they are thinking!! On this site, there are a variety of scenarios that your child will be able to make a choice and use reasoning skills to justify their mathematical thinking. Using games to support your child at home to reinforce math concepts they are learning in class can be fun for the whole family! Games provide children with opportunities to explore mathematical concepts such as number concepts, patterns and relationships. It also allows them to use models and strategies they are familiar with (e.g., arrays, ten frames, skip counting). Some math games are commercially available but most can be played with common household objects. In fact, most games that are not considered “math” games have many math concepts already in them. Try highlighting some of those concepts as you are playing. For some game suggestions, go to the "Resources For Supporting Your Child In Mathematics" tab found on the YRDSB Mathematics website homepage. To find out what your child will learn in math this year or to find other fun activities that you can do together as a family, please also visit the YRDSB Mathematics website homepage. Be sure to also try our Problem of the Month​. March 2019 - ​Spring Math: Math is Outside Too! ​Spring Math: Math is Outside Too! There are many opportunities to engage your children in conversations about money. From a very young age children are interested in learning about money and leveraging these conversations can have lifelong benefits. From learning the value of coins and dollars, to budgeting and finances, talking about money supports many different mathematical concepts (e.g., adding, subtracting, percentages and estimation).